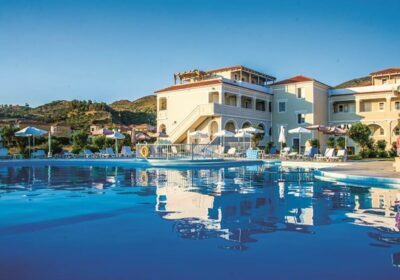 Klelia Beach Hotel Free Child Places Kalamaki Zante Low Deposit Family Holiday @Web2travelDeals. Online Since 2000. Finding the Best Value Family Holidays to Zante from UK airports. The 3 star Klelia Beach Hotel was previously called Klelia Hotel. Surrounded by exotic palm and olive trees in beautiful gardens, Klelia Beach Hotel boasts a prime location on the south coast of Zante facing Laganas Bay and looks out across the beautiful Ionian Sea. The hotel offers a great All Inclusive package along with comfortable rooms. In addition, the hotel is just a short stroll away from 7km of white sandy beach and close to the resort centre, making it the perfect location for couples and families. This 7km stretch of beach is the main breeding area of the caretta-caretta sea turtles. Zakynthos is just 6km away and the airport is approximately 4km away. Klelia Beach Hotel Reviews by guests generally give a rating of Excellent and comments include “Absolutely amazing holiday”, “Excellent food” and “Very clean hotel”. Claim your Free Child Place for Klelia Beach Hotel Kalamaki Zante. The hotel enjoys a privileged location facing Laganas Bay and the beautiful Ionian Sea. Zakynthos is just 6km away and the airport is approximately 4km away. All rooms have private bathroom with shower, telephone, radio, fridge and satellite TV (available on request for an extra charge), air conditioning (extra charge) and balcony or terrace. Some rooms are located in the annexe building approx 30 metres away across the road from the main building. Facilities at the hotel includes a bar, restaurant, TV lounge, swimming pool, childrens pool, jacuzzi, animation programme and safety deposit box rental.